National-Socialist Worldview: Is Breitbart now more radical than The Occidental Observer? 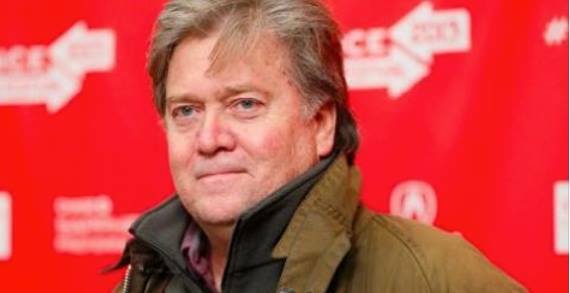 In regard to the hostile reactions toward the appointment of Stephen Bannon, former editor of Breitbart, as Donald Trump's chief of staff, there is an interesting contrast between the treatment given by The Occidental Observer (ostensibly a White Nationalist blog), and by Breitbart itself (until recently at least, a Jew-friendly "conservative" blog). TOO on 15 November ran an essay titled: "Political Assassination: The Smearing of Steve Bannon," by somebody called Marcus Alethia, Ph.D. The essay purports to defend Bannon by affirming that he is not a raging anti-Semite and not a racist as mainstream media have accused. Wait a minute. Why would there be any interest for a White Nationalist blog to demonstrate that Steve Bannon is not critical of Jews and not loyal to the White race? Are these really smears? Who was supposed to read this? It would make sense if some "responsible conservative" publication "defended" Bannon from such charges, but from the White Nationalist perspective a defense is neither necessary nor desirable. For Marcus Alethia, Ph.D., however, the desire to debunk these "smears" is understandable, since he is not a White Nationalist but rather, it is stated in the essay, "an American Jew." Coulter went on to add what she thought the appropriate response should be to those attacking Bannon. Exactly right, Ann. This kind of devil-may-care defiance is an important part of what the White majority of the United States has learned over the past sixteen months. "These teenagers" might be a reference to the "troll-army" of The Daily Stormer, or the cut-ups at MyPostingCareer who invented the term "cuckservative," but the Donald himself has exhibited a remarkably low level of concern about imputations of racism -- unlike every other politician. The example has steeled the spines of others. Rush Limbaugh, himself a figure of enormous influence, is among those who have been at least somewhat emboldened. Limbaugh's typical pattern, in the past, has always been to try to turn every racial issue into something else, often an economic issue, and to argue for what he apparently regards as White racial interests in that guise. The words "White people" were very rarely heard from Rush Limbaugh. On the Wednesday and Thursday after the election, however, Limbaugh spent considerable time talking about the fact that White people as a group have interests, and asked rhetorically why it should be wrong for White people as a group to vote according to their interests. This is unprecedented from Limbaugh. This is the effect of Trump's presidential campaign and the victory that followed. What a shame that The Occidental Observer apologizes for racism at precisely the moment when many White Americans have outgrown such apologies. Good article. Yes, it is a shame that TOO published such a rubbery, weasel-like essay. When I saw it, I realized TOO is compromised -- and this just after the election of Donald Trump, too. The problem, I think, is that professional academics like Kevin MacDonald form a kind of bourgeoisie unto themselves. They have achieved membership in that class, which they value highly, and consequently they are motivated to defend that class and their status within it. At TOO, this manifests in (1) short shrift for White activists who lack academic respectability, (2) out-of-hand rejection of "Holocaust Denial," and (3) very low editorial standards for anything written by anybody with a doctorate. Some of the most pointless or terrible essays on The Occidental Observer were written by men with doctorates. Think of Greggy Johnson's "Dealing with the Holocaust" or Dr. Lasha Darkmoon's ridiculous prophecies about a coming conflict with Iran. I might add that Tom Sunic, although amiable enough as a man, has contributed several very poorly written and pointless pieces. Once MacDonald saw that Alethia had "Ph.D." after his name, he was in -- because it helps MacDonald to reaffirm his membership in that class. I take your point of view seriously. I've seen at TOO the onslaught of authors with Ph.D.s, many of whom don't write well or with even a good knowledge of grammar, surprisingly. I can see this website as a kind academic bourgeoisie, but I also observe that Kevin MacDonald rarely ever mentions Hitler in any of his articles at TOO and publishes little about him; he mentions Israel just as infrequently on his website, and publishes little about that country as well. There have been no articles published about September 11th, particularly questioning who the culprits were in that event. So Holocaust Denial and avoiding any discussion of 9/11 beyond the official story is verboten. Nor have I once seen any defense or support written for Matt Hale. In fact, I have reason to believe he doesn't know who the man is or what he stands for. Is it all bourgeoisie protection? Isn't some of it as well, at least in part, fear of the Jew? Defending Hitler and Holocaust Denial I think are more or less the same from the perspective of academic conformism. These are traps to be avoided if you don't want to be stigmatized as an unworthy academic. I saw this with the way my first submission to TOO, "Our Weapon: the Truth," was redacted. The original version cited William Pierce, George Lincoln Rockwell, and Robert Faurisson as exemplars of the kind of approach that I was advocating. When it appeared on TOO, Rockwell and Faurisson had been removed -- obviously because these are names with which a respectable academic like Kevin MacDonald would not like to be associated. Only the name of Dr. William Pierce remained, creating the impression that the whole essay was built around that former physics-professor. On the whole, in my experience, Kevin MacDonald is a terrible editor. Many of his changes are heavy-handed or senseless. Thank you. I think you have covered the territory well and nailed it. My eyes are opened. Academic conformism. Have you ever read Miles Mathis's essays or "updates"? He wrote one on Kevin MacDonald and the TOO. He makes the case that academic conformism with the TOO is controlled opposition. I'd be interested to hear your views --if you have the time or care to. I've seen things from Miles Mathis before, and I think that he is a little bit paranoid. Mathis doesn't take into account, for example, that there was an evolution in MacDonald's view of the Jews. His first three books about Jews were not as critical as the fourth. That's why he was able to hold positions of respect in mainstream academia until that fourth book. Despite MacDonald's shortcomings, I don't think he's anything other than what he appears to be. You let me see your discriminating mind at work. I clearly understand your point of how Mathis "doesn't take into account the evolution of MacDonalld's view of the Jews." Thanks for your feedback.